Rio Grande’s Payten Davis, left, sets to send a shot past Midway goal keeper Rebekah McKee during the first half of Saturday afternoon’s River States Conference women’s soccer match in Midway, Ky. Davis scored three goals in the RedStorm’s 7-4 win over the Eagles. 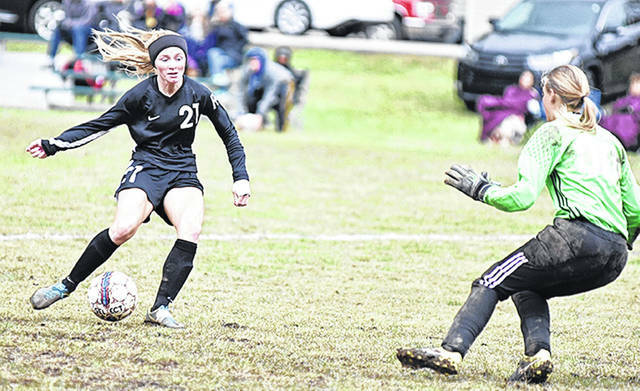 MIDWAY, Ky. — Payten Davis scored three times, while teammate Brooklyn Pritt added two scores of her own to fuel the University of Rio Grande in a 7-4 win over Midway University, Saturday afternoon, in River States Conference women’s soccer action at a rainy and muddy Midway Soccer Field. Senior Kelsie Lee (West Chester, OH) added a goal and an assist of her own for the RedStorm, who finished their regular season schedule at 7-8-2 overall and 5-3-1 in conference play. Head coach Tony Daniels’ squad secured a berth in the upcoming RSC Tournament and will travel to an opponent still to be determined for next Saturday’s quarterfinal round. Midway closed its regular season at 6-8 overall and 2-7 in league play. Davis, a sophomore from Chillicothe, Ohio got the first two parts of her hat trick in the opening half when Rio scored on each of its three shots. The host Eagles actually had the game’s first score when Regan Snyder hauled in a pass from Marissa Sauer and finished into an open net from eight yards out just 10:50 into the match. The RedStorm wasted little time in recording the equalizer when junior Brooklyn Pritt (Scott Depot, WV) scored from the left wing just under two minutes later. Junior Amelia Bragg (Jackson, OH) had the assist on the goal. Snyder scored again on a thru ball by Alexis Little to give the Eagles a 2-1 edge with 21:30 left in the half, but Rio grabbed a lead it would never relinquish on consecutive unassisted goals by Davis – the first just 24 seconds after Snyder’s go-ahead score and the second with 5:53 remaining before the intermission. Lee made it 4-2 just 1:47 into the second half, scoring from 15 yards out off a pass from fellow senior Rachel Haddad (Gallipolis, OH). Snyder completed her own hat trick and pulled the home team within 4-3 with a goal off an assist by Mallory Cox with 31:26 left to play, but Davis answered just 26 seconds later with a goal off a penalty kick to give Rio back its two-goal advantage. Pritt’s second goal — via a pass from Lee — made it 6-3 with 8:10 left to play before Snyder scored her fourth goal of the game for Midway, a shot from 25 yards out off a pass from Hailey Allen, to get the Eagles by within two. Rio Grande closed out the scoring with 2:45 left when senior Katie Zuniga (Massillon, OH) scored on penalty kick. The RedStorm finished with a 12-8 edge in shots overall and a 9-4 edge in shots on goal. Senior keeper Andrea Vera (Quito, Ecuador) earned a win in net for Rio despite not recording a save. Rebekah McKee started in goal and had one save for Midway, while Alexandria Klimek played the final 14:57 in net and had one stop.